Just in time for “dark season,” we received a FlashBak safety light. I’ve put this baby through the paces over the last few weeks. This includes freakishly warm temperatures at the beginning of this month, lots of rain earlier this week, and snowy slush yesterday. Construction is simple, and use is straight-forward. 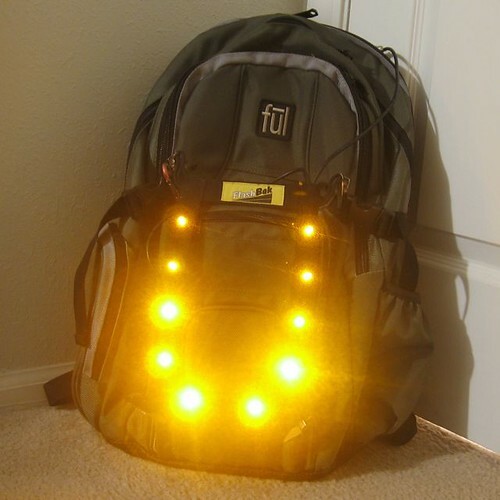 There’s a battery pack, an illuminated pushbutton remote to turn things on and off, and the light rig itself: 10 bright amber LEDs embedded in a nylon strap. Several alligator clips are attached to the rig with paracord, so it can clip onto pretty much anything from jerseys and hydration packs to panniers and bookbags. When I said the LEDs were bright, I meant it. Aside from cropping, this image came straight off my camera without any other manipulation. Other cyclists and a few motorists have also commented on how bright it is. You will be seen. The on-off remote can be clipped to your backpack strap, to the front of your shirt, or somewhere else that’s easy to get to and see. It has a matching LED in it as well, saving you the hassle of doing that probably-familiar “is my light on?” neck-crane maneuver. Here’s a video of it in action. There’s only one mode, and it’s a pretty eye-catching pattern. I don’t know how many hours I’ve gotten out of it so far, but it’s still running on the original 3AA batteries that it shipped with. 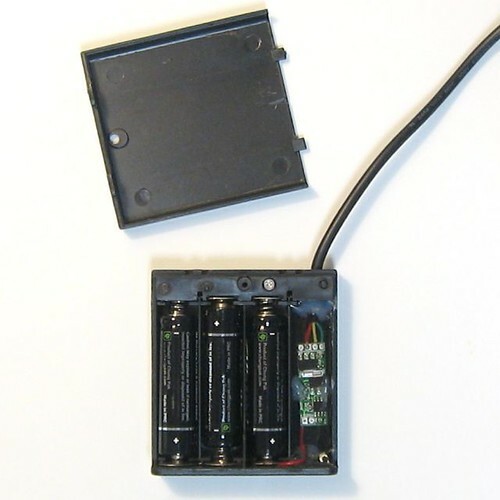 The battery pack also holds the electronics “brain” (embedded in waterproof epoxy) as well as a hard on-off switch to remove any possibility of accidentally turning it on when you don’t want to. All in all, this is a solid-built rig that seems to hold up well in all weather conditions. It’s pretty much the brightest rear light I’ve seen on a bicycle before, and the amber color is a nice touch. I still usually combine it with a steady-lit red rear tail light and DOT reflectors, though. Some steady, bright-red LEDs and/or reflective piping added to this rig would be a great addition to the product line, in my opinion. Distance is hard to judge by flashing lights alone. Although this product was given to me by the manufacturer, I tried pretty much everything I could do within the parameters of my usual commute routine to break and abuse this product. The above is my brutally honest and unbiased opinion. Interesting. Looks like a nice way of adding light a bit higher up (and therefore more visible) than the usual red light on the seatpost approach. Bright, yes, but seems like a complicated solution to a simple problem. A Planet Bike Superflash clipped to a backpack would be just as visible for half the price. No mounting point? Sew one on. Easy. 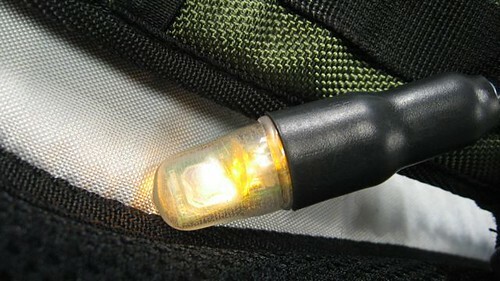 I use a PB Superflash as my main bike-mounted tail light, and I can tell you that it’s nowhere near as visible as the Flashbak. I like the idea of throwing in another color in my “nighttime visibility kit” — amber lights in such a pattern may really help you stand out from all the red lights that surround us at night. That would be a great addition for my commute. I currently have a flashing reflective triangle on my messenger bag, a blinky on my helmet and my rack, but this would be very nice. That’s a great idea. I just changed shifts at work and my ride home is dark with lots of traffic. When I was on my previous shift, the ride in was dark but didn’t seem as dark and definately a lot less traffic. I just wonder about those clips on a pannier set-up. Since I’ve started commuting sans-backpack, I would have to get creative with the mounting of such a device. This is a damn good idea. Add some velcro and it looks like it’d mount nicely to the cover flap of the Banjo Bros. commuter backpack. Great write-up. We’re both runners and can imagine using this on our Camelbacks when we have to run at night. I’m a big fan of lights and reflectors and I wear a Camelbak with a relective Slow Moving Triangle on it. At some point, though, I wonder if there’s a point when you hit Too Much? Temptation is being resisted, but I feel myself reaching for my credit card. Putting it on my X-mas list now. Wrapped them around the frame of my bike, but could use to cover your bag etc. I have seen these lights as I ride around Austin. They are nothing like christmas lights….these babies can be seen forever! I put xmas lights on my ride around this time of year, for fun. The Flashbak is the brightest rear light I have seen to date. I really need to get one too. The FlashBaks do seem more complicated than a simple red blinkie light. But, I guess bicycles originally came with coaster brakes, no gears, and simple red reflectors; and people embraced the changes because of the gains in technology. Sometimes something better just comes along and creates a paradigm shift. I like the innovativeness of Americans. Finally, you can safely tell if your rear light is ON while riding. As a cross-country rider, I have been looking for something to light me up in daylight. This appears to be it, but there is no daytime video available. Should I take a chance? 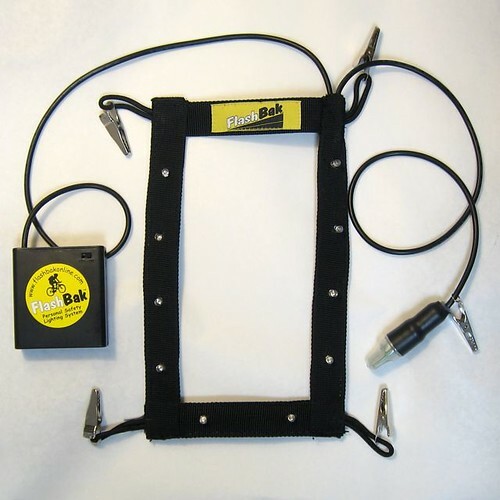 I bought Belt Beacon (no longer produced) when I was driving at dusk in the Connecticut countryside and saw all the automobile drivers giving two cyclists a wide berth when they passed. I haven’t seen anything like it before or since, Ever.